I am sitting up the top of Jebel Hafeet, one of the highest mountains in the United Arab Emirates. It is dark and I am staring out at the stars; the moon, lights of settlements and moving cars glitter the plain below. Less than 150 kilometres away in a hospital bed is my mate, Mike Ballard. 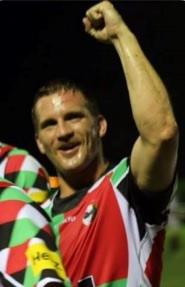 Mike, a US national, teacher, and all round top bloke, was seriously injured in the West Asian Club Rugby Championship final six days ago, played between the team I help coach, the Abu Dhabi Harlequins, and the Jebel Ali Dragons. Mike, a loose head prop and in only his third season of rugby, was one of two well-deserved Harlequins nominated for the overall senior men Arabian Gulf Player of the Season award this year. He played the final as he had all season: hard and at a consistently outstanding level. He was our hammer on defence and our workaholic on attack, assisting and assisting, and carrying hard when the opportunity arose. About thirty minutes in, Mike fell awkwardly in a tackle, was stretchered from the field and has been numb from the waist down ever since. His lower vertebra was fractured and his spinal cord has suffered what has been described by doctors, as “significant damage.” Mike is to be flown tomorrow to Grand Rapids in Michigan, United States, where he will receive treatment and physio to aid his recovery. “I’m looking forward to the next stage,” said Mike when questioned by local journalist Martyn Thomas as to how he was feeling. I can hear Mike saying that in his very American accent. He would have finished the sentence with a determined stare and meant what he said. Facing the biggest challenge of his life, up to one year’s intensive physio to get mobile again, Mike is looking forward to it. Mike’s injury rocked me to the core, especially in that first 24 hours. It brought back memories, vivid memories. In that very same final, three years earlier, as the captain of the Doha team, while not nearly as significant as the challenge facing Mike, I had my own freak accident – dislocating my knee, tearing every ligament within it and incurring nerve damage, affecting my feeling from the knee down. Three years later, the numbness is still there and annoys me on occasion, but like Mike won’t for his injury, I haven’t let it get in the way of doing anything I have wanted to do. I have run again (coming third in the fitness tests I set the Harlequins forwards, and taking pleasure after such a long recovery road in telling them that they need to get fitter), surfed bigger waves than pre-injury, assisted in filming an underwater documentary on New Zealand’s coastline in challenging diving conditions; even played half a match of rugby. And having been the beneficiary of the generosity of a community, the Doha rugby community, as Mike will be in the Abu Dhabi community, I have been moved emotionally by people, who fundraised and helped pay for the expensive operations. People can just be so incredibly kind sometimes; it makes ones eyes moist thinking about it. Going through a life changing event makes me think we need to simplify things right down sometimes. You never know what the next day will bring. Smile at the sunrise. Be grateful for shelter, food, water, family and friends. These are the fundamental building blocks, as I found three years ago and as Mike has found this week. But as people, we all want more. That’s cool; it’s only natural to want to grow. Everybody’s different. We all have different dreams; some involving mental application, others involving physical application, some involving both. Whatever dream it is you want to chase down, go for it. But as a bottom line, if we all go on our personal adventures with good intentions and aspire to have a positive influence on those around us, whether family, friends or society, then surely we have succeeded in bringing joy to the world we know. We would have made people smile and hopefully had a positive impact. And isn’t that what we should all be trying to achieve at the end of the day? Isn’t that what’s important? The guy is a champion. Without a doubt one of the nicest and most likeable characters of our team and whom I have met. He’s going to deal with the challenge that has come his way with a smile on his face. He’s going to give rehabilitation his best shot. He’s moving on to bigger and better things and while he admits he dwelled on what had happened for a day, he is viewing it as an opportunity, to take a different route and go on adventures that weren’t previously open to him. As strong as an Ox, Mike’s already talking about Olympics in “a new sport” he “has never heard of,” and “that’s really exciting.” He’s also talking about continuing teaching “once my rehab is done” and writing books, like his father. Mike is going to be fine. And he has been overwhelmed with the love and support he has received the past six days. “My family, my friends, they have been here for me. Every minute of the day I have had someone to talk to. I’m the luckiest guy in the world,” he said, with that same accent that makes you smile and that same indomitable stare. I love this guy, have been so upset by what happened to him, but so proud of how he is rising to the challenge that life has thrown at him. Mike, you will rise to this challenge. I know you. We know you. You know you. Kia Kaha. A mosquito just landed on me (don’t forget I’m up on the top of Jebel Hafeet). Shaken out of my reverie, I gently coax it away, noticing an orange on the table. I pick it up, have a good look at it, smile, and think how lucky I am to have an orange. I’ll take Mike an orange tomorrow. He’ll like that and understand its significance. This guy is a legend and a role model. P.S. Abu Dhabi lost the West Asian Club Championship rugby final this year, as Doha did in that match three years ago. It initially feels pretty demoralising lying there in hospital, with a serious injury, not being able to finish the match, having put so much physical and mental effort into a team, and only finding out later that you lost. You always remember the result. That’s sport and competitiveness. There has to be a winner and a loser and Mike or I or any sportsperson wouldn’t have it any other way. The Jebel Ali Dragons were outstanding on 4 April 2014 and are worthy West Asian Club Champions. But on Friday, as in Doha three years ago, something powerful occurred, something that reinforces why it is we play and love this game. Rugby brought the community together. Every team from around the Gulf has been in touch with Mike, members of the other clubs visiting him, such is the regard in which he is held, everybody wanting to help this champion with his challenge. 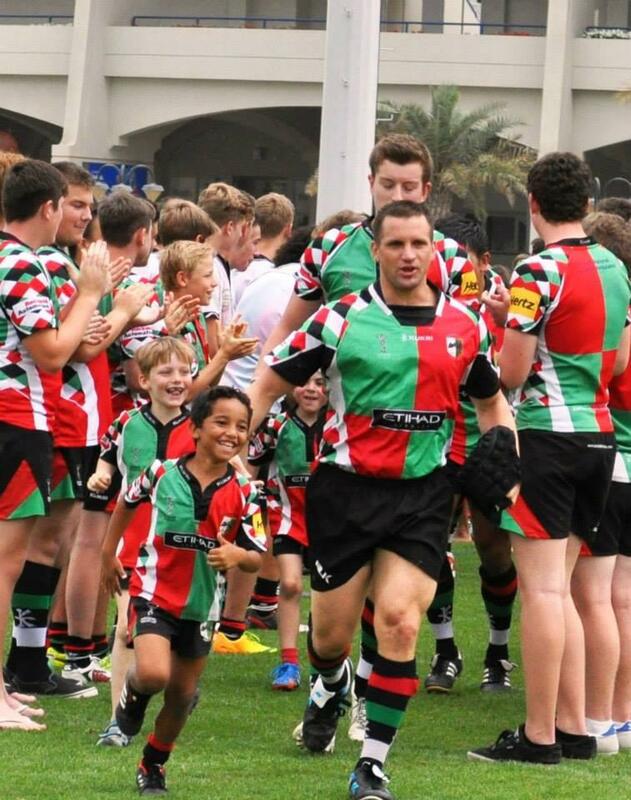 The Arabian Gulf rugby community has this week epitomised the ethos of rugby, which teaches physical challenge, leadership, how to be a member of a team, how to be disciplined, how to have heart, how to have fun; the values of courage, sportsmanship and humility. And this week Mike has defined courage, and will continue to define courage, and the rugby community has collectively shown the high calibre of people involved in our sport. Thank you all for being so wonderfully kind to Mikey. We are all looking forward to taking those steps with you mate. Ka kite ika a whiro. Te hei mauri ora.